Home News & Update English Rani Mukerji hoists Indian flag in Australia; makes the country proud! 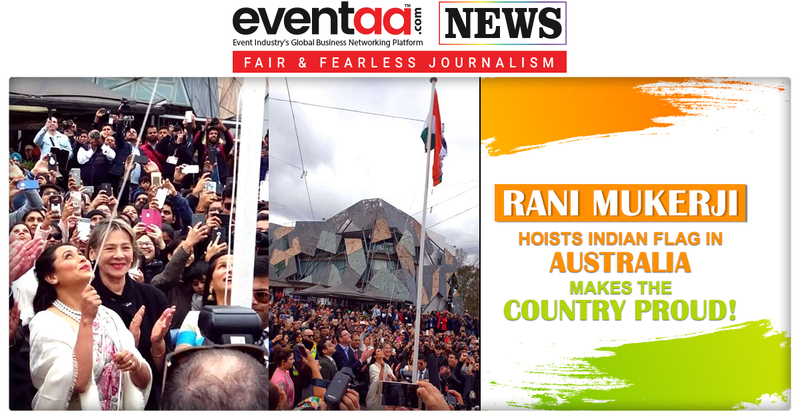 Last year it was Aishwarya Rai Bachchan who was the first female actor ever to hoist the Indian National Flag at the Indian Film Festival of Melbourne (IFFM), this time it was Rani Mukerji who was the star attraction who unfurl the Indian tricolor. The event took place on August 11 at the iconic Federation Square in Melbourne city where a number of immigrants from all across Melbourne flocked to see their favourite Bollywood star. Not only that, the ceremony also saw Daniel Andrews, the Premier of Victoria, equivalent to the chief minister of the state, and several other important officials in attendance. Rajkumar Hirani, Richa Chadha, Freida Pinto, Ali Fazal, Vicky Kaushal, Abhijaat Joshi, Mrunal Thakur and comedian Saadiya Ali were among the few Bollywood celebrities who attended the festival. On the work front, Rani has grabbed a cameo in Aanand L Rai's upcoming film 'Zero' starring none other than Shah Rukh Khan. IFFM which officially began on August 10 is Australia's annual celebration of films from India and the subcontinent.